Tim finding me running out the backdoor of our old apartment. Hello…the apartment was on fire. I had to get out! Being on top of Tim and hysterically trying to give him CPR. Hello…he had drowned. I was only trying to save his life. Waking up and coming to while in the process of dialing 911 on my phone. Hello…there were men in the house. I was just calling in a break in. Luckily, I generally wake up in full panic mode and jump out of bed so Tim is woken up by my shenanigans. We have also learned through trial and error that turning on the light will cause me to wake up on my own within a minute or so. Of course, before that happens I yell at Tim since he barely lifts his head now and tries to just continue sleeping and ignore his crazy wife. Good times, good times. 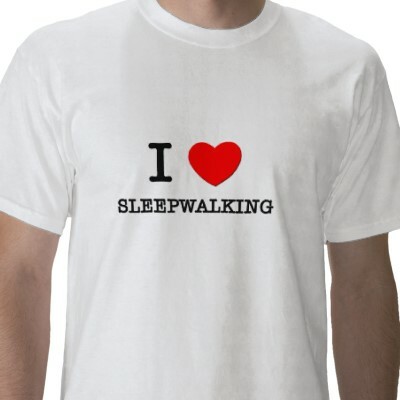 I saw this shirt on zazzle.com. I think maybe it was made for me.